This past Saturday we celebrated the start of the fourth annual “Take a Hike” at the Highlands Nature Center Kiwanis Amphitheater. Yavapai County Attorney Sheila Polk joined representatives from the City of Prescott, Prescott National Forest, and the Highlands Center in kicking off the 2011 Hiking Spree. We hiked the first of our planned eight of twelve hikes on the Homestead Trail (#305) after connecting via the Highlands Trail (#442). The recommended hike was 1.4 miles out to Highway 69 and back. However, we crossed the highway and walked another 10-15 minutes before returning to our car parked at the Nature Center. The entire Homestead Trail is seven miles. We enjoyed lunch at the Lynx Lake Cafe. 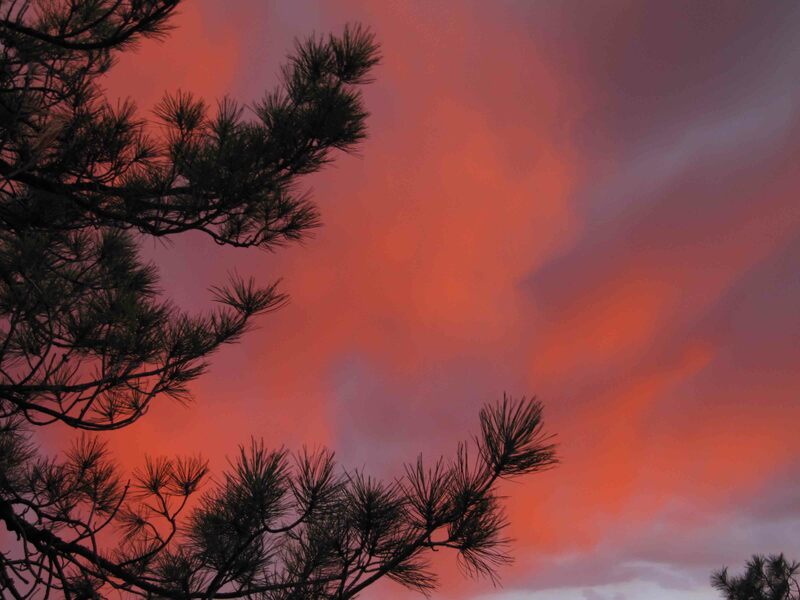 The sunset from our deck reinforced how lucky we are to live in an area surrounded by more than 800 miles of trails. Take a hike! The first festival celebrating the Arizona State Centennial took place in Prescott, the state’s first territorial capital, this past weekend. Although we missed the Yavapai County Courthouse Friday afternoon unveiling of the Forever Stamp banner celebrating Arizona statehood which kicked off the Arizona Best Fest, we took advantage of being locals to explore the nine blocks of downtown Prescott dedicated to this unique, special event. We took a quick pass through both the Natural Resources Pavilion and the Science & the Future Pavilion. We enjoyed the colorful costumes of Ballet Folklorico Arizona in the Hispanic Village while enjoying margaritas in the Margarita Cantina. On Saturday, after purchasing a couple of books dedicated to local and state history, we visited the Elk’s Opera House for the “Yavapai: Mother of Counties, Cradle of Statehood” Powerpoint presentation by Elizabeth Ruffner. Then we made our way to the Indian Village located in the Mile High Middle School athletic field for the conclusion of dance by Shammi Lee Hoskie, a Navajo dressed in a deep blue velvet-like dress. Four sixth grade students from Dine Bi Olta School, a Navajo immersion school, introduced themselves first in Navajo and the in English before singing songs to the beat of a drum. Five Hopi Eagle Dancers performed as the crowd steadily increased. Seven tribal peoples were represented at this gathering that included representations of their dwellings, food and crafts. We enjoyed a margarita while listening to the Tina Bailey Band on the Goodwin Street Stage. The lead singer did a good job of impersonating the Janis Joplin sound on a series of songs. Western Town featured a mechanical bull that challenged guests to hold on after signing a liability waiver. Young people also had an opportunity to pan for gold and received a small bag filled with replica nuggets. We appreciated the microphones on each of the costumed actors who presented “Tragedy at the OK Corral” in the Western Theater. We concluded our outing appropriately with a tour of the History Pavilion. 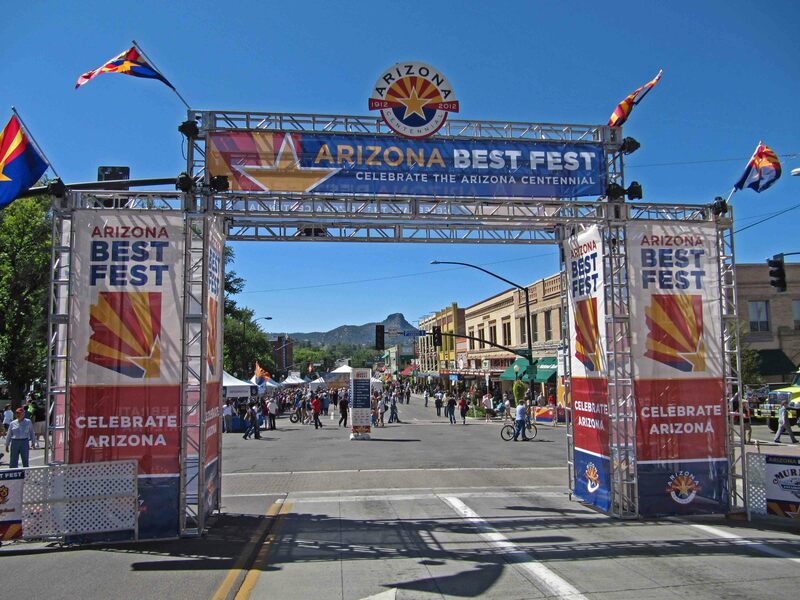 The Arizona Best Fest was a very well organized event which showcased Arizona entertainers, artisans, and restaurants. On Labor Day we parked just beyond where the pavement ends on Copper Basin Road, Prescott and hiked the High Valley Ranch Trail (#391). A large new house is being built adjacent to the trail head. 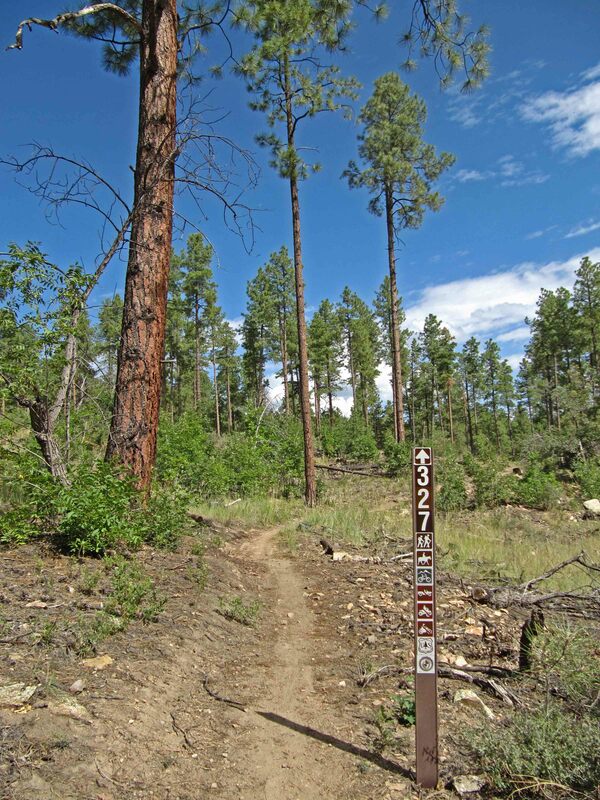 This trail traverses through a ponderosa pine forest which suffered fire damage some years ago. We met several mountain bikers along the way. At the intersection with the Potts Creek Trail (#327) we headed west to make our hike a loop. The trail terminated with the Cold Springs Trail (#393) which we had hiked on a windy fall day two years ago and Forest Road 54. We completed our loop taking this forest road to Copper Basin Road. There are several camps in this area. Camp Charles Perlstein is well developed with numerous amenities including horses and a swimming pool. This camp is maintained by Congregation Beth Israel, Scottsdale. We also passed Copper Basin Bible Camp, churches of Christ, and Ponderosa Camp, a United Christian Youth Camp. On Sunday we drove the Old Walker Road which is unpaved for four miles to Potato Patch. I was surprised at the number of vehicles traveling on this narrow, rough road and the number of homes which probably number around 300. Apparently many of these cabins are owned by those looking for a summer residence with temperatures 25-30 degrees cooler than Phoenix. After passing the Potato Patch junction the road is even rougher and narrower and continues to have frequent turnouts. We passed a beautiful lake with high fencing along the road. We circled back to Prescott via the Senator Highway on a wider gravel base until we again found pavement. Several quads were enjoying the day on this road. About eight campsites parallel this road, some with magnificent views. After this exploratory drive, we washed the dust from the car. Is this the end of summer?